Wanderers finished bottom of the Championship as they dropped down to the third tier but that did not stop Holding picking up the club's player of the season award. Arsenal announced his signing on Friday, with both the fee and length of contract undisclosed, to make the versatile defender their third summer acquisition. Harding follows Granit Xhaka and Takuma Asano in moving to the Emirates Stadium but it remains to be seen if he will be involved with the first team straight away. He was a late replacement call-up for England's U21 squad which won the Toulon Tournament in May, making two appearances during the competition. Bolton tweeted their gratitude to the player following confirmation of the deal. 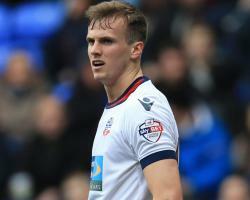 "Everyone at #BWFC would like to thank @RobHolding95 for his efforts during his time with the club, and wish him well in his future career," Bolton posted on their official Twitter account. Arsenal's own statement on Holding's signing closed with confirmation the Gunners "remain in the market" for new players, with further attacking options the most likely target before the close of the window.